Learn more about who's consulting on or referencing the BC Energy Step Code. Communities can use a wide variety of policy tools to incentivize or require the BC Energy Step Code. On this page, we’re outlining how local governments and others are putting the standard to work. You can find a summary of these efforts in this info graphic. Let us know how you’re referencing the BC Energy Step Code by emailing the Building and Safety Standards Branch and we’ll share your story here. These local governments have submitted their initial notification, indicating they have started to consult on the BC Energy Step Code (listed by date of submission). The symbol * means the local government now references the BC Energy Step Code in a policy, program or bylaw – see how below. The City of Burnaby is taking a phased approach to the implementation of the BC Energy Step Code, starting with Part 3 policy. Part 9 policy is currently in development. The City of Campbell River offers financial incentives for new energy-efficient residential buildings constructed to meet the BC Energy Step Code. Incentives are available starting April 1, 2018, while funding is available. The City of Kimberley’s Energy Efficient Building Incentive Program (EEBIP) is a simple and pragmatic approach to help local builders learn and adapt to new methods and materials to reduce the energy demand and carbon emissions associated with the heating and cooling of buildings. Since the program was modified in 2017 to reference the BC Energy Step Code, each completed project has achieved at least Step 3 or better. The City of Kimberley’s program has been effective in helping improve the knowledge and expertise of local builders in high-performance building construction, and the quality and energy efficiency of new buildings . At its April 9, 2018 meeting, New Westminster Council endorsed in principle the implementation framework outlined in the report ‘Proposed BC Energy Step Code Requirements for new Part 9 Residential Buildings’ and directed staff to proceed with next steps to support the successful implementation of the BC Energy Step Code. Staff will report back to Council on the outcomes of this process before implementing the BC Energy Step Code. The City of North Vancouver has put into place a robust and visionary implementation approach that targets buildings city-wide at lower levels of the BC Energy Step Code, with incrementally higher steps within the city’s Rezoning Policy, and at highest steps in exchange for density in specific neighbourhoods. The City of Penticton will be implementing Step 1 on March 15, 2019 for all Part 9 residential buildings as regulated within City of Penticton Building Bylaw No. 2018-01 Part 26. This timeline is based on initial Building Bylaw amendment feedback and will allow for more education for industry in working with Energy Advisors and on detailing for air barriers. The City of Richmond formally adopted bylaws enacting the BC Energy Step Code at a Public Hearing held July 16, 2018. The BC Energy Step Code will enter into force for new Building Permit applications as of September 1, 2018 (noting that there are in-stream provisions for projects with Development Permits issued or in process). The City of Surrey has adopted the BC Energy Step Code effective April 2019. Starting April 1, 2019, the Step Code will apply to new, BC Building Code Part 3 and Part 9 commercial and residential buildings in Surrey, changing the City’s inspection, permitting and review processes and requirements for new construction. Victoria City Council adopted the BC Energy Step Code on April 26, 2018, and ratified the Bylaw on October 4, 2018. Beginning November 1, 2018, there is an interim transition period during which builders and developers will need to meet Step 1, meaning they will need to use an energy model and conduct airtightness testing in the building. Then, beginning January 1, 2020, all new construction will be built to be 20% more energy efficient than current code requirements. The City will support builders to use an energy model, conduct a mid-construction blower door test, a post-construction blower door test, and secure a home energy label through a $500 rebate supported by BC Hydro. The Comox Valley Regional District is offering rebates for new residential dwellings that achieve at least Step 3 of the BC Energy Step Code. The rebates will range from 25% for achieving Step 3 to 100% for achieving Step 5. The program started on January 1, 2018. District of Lake Country adopted a new Building Regulation Bylaw effective March 5, 2019 and will be implementing Step 1 of the BC Energy Step Code for all Part 9 buildings effective April 1, 2019. Step 3 will be implemented for all Part 9 buildings other than accessory suites effective October 1, 2020. Accessory Suites will be required to meet Step 2, effective Oct 1, 2020 and Step 3 effective January 1, 2022. The District of North Saanich formally adopted bylaws enacting the BC Energy Step Code on October 22, 2018. Effective January 1, 2019, all Part 9 and part 3 buildings will be required to be built to Step 1 requirements. Effective January 1, 2020, Part 9 and Part 3 buildings will be required to meet Step 3 requirements, except Part 9 buildings equal or less than 92 square meters in size, which will only require Step 2 compliance. On October 9, 2018, the District of Oak Bay Council adopted the BC Energy Step Code. As of November 1, 2018 all new Part 3 and Part 9 buildings are required to meet Step 1 of the BC Energy Step Code. This will transition up to Step 2 for Part 3 buildings and Step 3 for Part 9 buildings effective January 1, 2020. The District of Sparwood Energy Step Code Policy is designed to encourage builders to choose the performance path when complying with BC Building Code energy-efficiency requirements. This will assist in understanding and adapting to BC Energy Step Code requirements. Rebates range from $500 plus a contribution to Energy Advisor Fees for Step 1 compliance, to 100% of Building Permit fees plus a contribution to Energy Advisor Fees for Step 5 compliance. 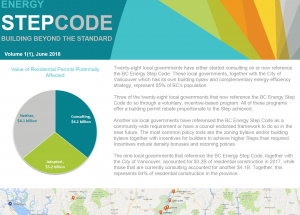 The BC Energy Step Code went into effect in the District of Squamish on July 1, 2018. All new residential and commercial buildings must be constructed to Steps 1, 2, 3 or 4 by 2021 following a phased-in approach. The North Shore municipalities (City and District of North Vancouver and District of West Vancouver) have aligned the minimum bylaw requirement for almost all building types, effective July 1, 2018. In support of high-performance buildings, West Vancouver Council has directed staff to bring forward bylaw amendments to remove barriers, and to formalize common deliverables through rezoning into a policy that increases clarity for applicants, staff and the community. The Resort Municipality of Whistler will require all Part 9 residential buildings to meet Step 3 of the BC Energy Step Code effective January 1, 2019. Step 4 of the Energy Step Code will apply to all new Part 9 residential buildings on properties applying for rezoning to increase density or permit additional uses, and any new residential buildings that include construction of additional in-ground basement floor area excluded from gross floor area calculations. The UBC Residential Environmental Assessment Program (REAP) is UBC’s green building rating system and REAP gold certification is required in UBC’s neighbourhoods. On September 27, 2018, the UBC Board of Governors approved amendments to REAP, requiring new Part 3 residential construction at UBC Point Grey campus to meet a minimum of Step 2 of the BC Energy Step Code. Optional credits within REAP can be obtained for projects that achieve higher steps. On February 19, 2019, the Council of the Village of Anmore approved an amendment to the Village of Anmore Building Bylaw to require compliance with Step 1 of the BC Energy Step Code for construction of all new single family dwellings. While not subject to the BC Energy Step Code, the City of Vancouver has its own zero emissions building plan. The Plan has four strategies to require the majority of new buildings to have no operational greenhouse gas emissions by 2025, and all new buildings to have no greenhouse gas emissions by 2030.